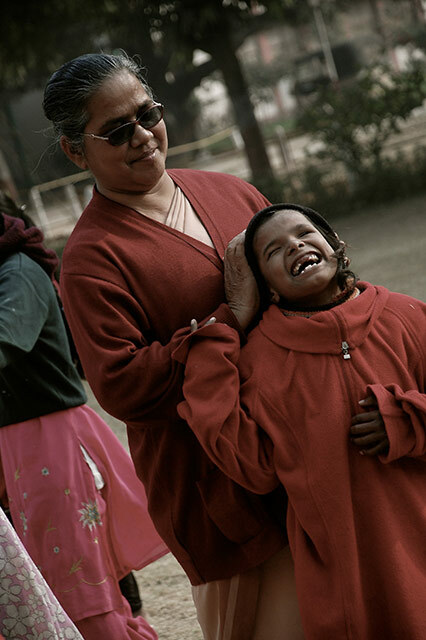 On the 9th of June, 1975, Sister Irene and Sister Abhilasha started the Jeevan Jyoti Blind Residential School in Sarnath with a single student. 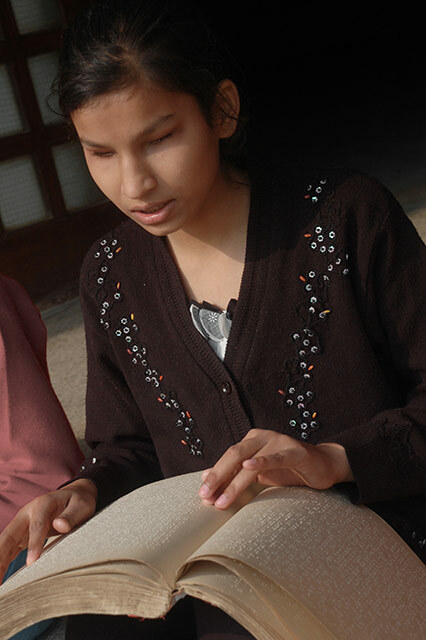 Today, the school is host to 215 girls, 187 of which live in the hostel, the rest being day-scholars. 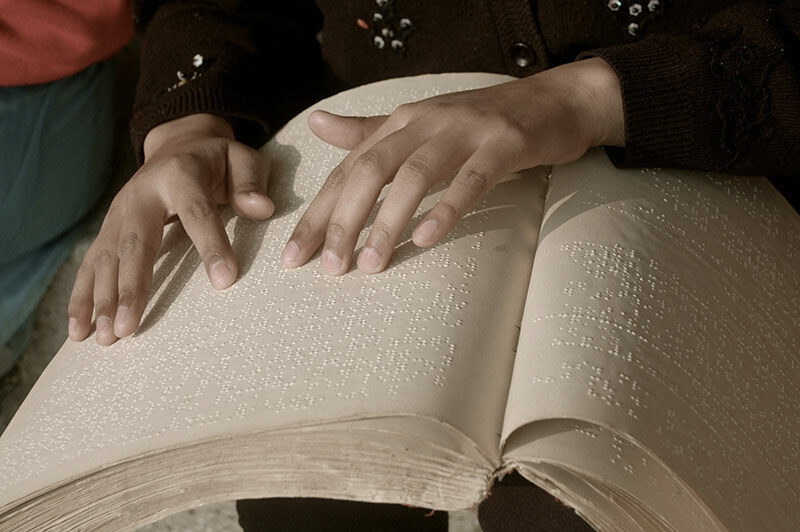 The school is truly an innovative pioneer in education for the visually impaired. The school has three main sections – A school wing dedicated entirely to the blind till class 6, an inclusive school that begins at class 7 for both regular students and visually impaired students, and the hostel wing. These three structures are built around a big lawn that boasts a vegetable garden, and several flowers that the children can identify by fragrance. The nuns that run this school are extraordinarily dedicated to this cause, and have taken on the positions of teachers, mothers, doctors and friends for these girls. They are adamant that the curriculum be followed but also foster each student’s individual artistic talents and inclinations. 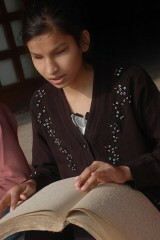 The girls read and write in Braille effortlessly, and are an inspiration in an otherwise hopeless situation. His Holiness has donated a computer laboratory and a media room to the school. These 30 special computers use a voice-activated software called Jaws that allows for an interactive session, and a keyboard in Braille. This is a revolutionary advancement for the visually impaired, who until recently have had no access to computer education. The visually impaired in villages have been treated differently and denied the opportunities available to their peers. This is the reason that it is especially rewarding to see these students being ushered into the technological age and being taught the same skills as their visually intact counterparts. In the media room, the students are able to enjoy music and movies. They are given a wide range of information – news, educational movies, and the iconic cultural music and films of their times to keep them at par within their current temporal context. This is important for their growth as individuals, and is giving them a chance to experience the things they normally would not have access to. This school is ever expanding- with programs for adults, education for the families of the disabled, medical treatments, and programs for people with a range of physical and learning disabilities. They also train candidates to become teachers for the disabled, in skills ranging from Braille and sign language to psychological support.